In this file photo, aircraft carrier USS Carl Vinson (CVN 70) transits in the Arabian Gulf, January 21, 2012. 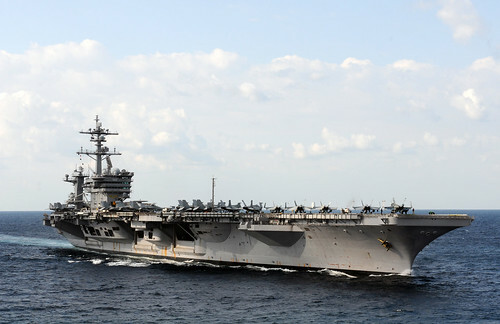 Carl Vinson is scheduled to participate in exercise Malabar 2012 with the Indian Navy. YOKOSUKA, Japan (April 6, 2012) - Naval personnel from India and the United States will participate in Exercise Malabar 2012, April 9-16, 2012. Malabar is a regularly scheduled naval field training exercise and has grown in scope and complexity over the years. Malabar 2012 is the latest in a continuing series of exercises conducted to advance multinational maritime relationships and mutual security issues. Participants from the U.S. Navy include the aircraft carrier USS Carl Vinson (CVN 70), the guided-missile cruiser USS Bunker Hill (CG 52), the guided-missile destroyer USS Halsey (DDG 97), a logistics ship, P-3C aircraft and a submarine. The exercise will feature both ashore and at-sea training. While ashore in Chennai, India, training will include subject matter expert and professional exchanges on counter-piracy operations, carrier aviation operations, maritime patrol and reconnaissance operations and anti-submarine warfare operations. The at-sea portions will be conducted in two phases. Phase I will be conducted in the vicinity of Chennai while Phase II will be conducted in the Bay of Bengal and west of the Nicobar Islands. They are designed to advance participating nations’ military-to-military coordination and capacity to plan and execute tactical operations in a multinational environment. Events planned during the at-sea portions include liaison officer professional exchanges and embarks; communications exercises; surface action group operations; helicopter cross-deck evolutions; underway replenishments; gunnery exercises; visit, board, search and seizure (VBSS); maritime strike; air defense exercises; encounter exercises; shore-based surface strikes; and anti-submarine warfare. The Indian Navy and U.S. 7th Fleet have a common understanding and knowledge of a shared working environment at sea. This exercise helps to advance the level of understanding between our Sailors and we hope to be able to continue this process over time. The United States and India share common values and seafaring traditions. Our navies are natural partners, and we look forward to continuing to strengthen the bonds and personal relationships between our navies.